Farmgirl Fare: Daily Farm Photo 5/12/06: Who's Sog-gy Now? Lamb Report: Shortly before I did a midnight barn check last night, little Alison (the co-star of my very first blog post, An Unexpected Beginning) had a very big baby girl. I'm talking so big I thought somebody's two week old lamb was standing next to her. Mother and daughter are doing fine and relaxing at the Bonding Suite Inn. Alison has become my new favorite sheep, but I'll have to wait a day or two before I tell you why. Just keep your fingers, hooves, and paws crossed that my plan works. Current Lamb Count: 22. Number of lambs back to bouncing: Pretty much all of them. Number of half-asleep mothers who were run over, jumped on, and generally trampled by a pack of gregarious bouncing lambs around midnight last night: Pretty much all of them. Number of farmgirls wondering if sheep might in fact be safer if we turned off Alice Cooper Nights on Non-Stop Classic Rock Radio: 1. Donkey Report: A farrier is coming this afternoon to give Donkey Doodle Dandy (who is not halter trained and who I don't believe has ever had his feet worked on) a much needed pedicure. My first question for the farrier: "So do you work on donkeys?" "Well, we don't really like to, but. . ."
Best question farrier asked me: "Is he, uh, all jack?" (Long pause.) "Or is he castrated?" Questions I forgot to ask: How much this is going to cost. And if he could please bring a sedative (for each of us). I said I could probably get Dan into a pen about the size of a large living room. It was requested that I put him somewhere much smaller. My Plan A Trap could apparently be smelled a mile away. My Plan B Trap has a donkey in it. This ought to be interesting. The farrier is bringing his son as backup. I'm baking chocolate chip cookies. Whatever else happens, at least we'll have cookies. I know I should probably invent some new kind of sweet treat and call them Donkey Doodle Dandy Bars (catchy, isn't it? ), but there just isn't time. However, depending on the farrier's rates (which I think kept going up each time I answered another question about Dan yesterday), I may have to resort to creating and marketing a few thousand of them—or something else I've been thinking about. I'll let you know. This is all, of course, assuming they can even find the farm. Okay! That made my morning reading your post about Dan's upcoming Farrier event. All jack indeed! Interesting is a good word for it. 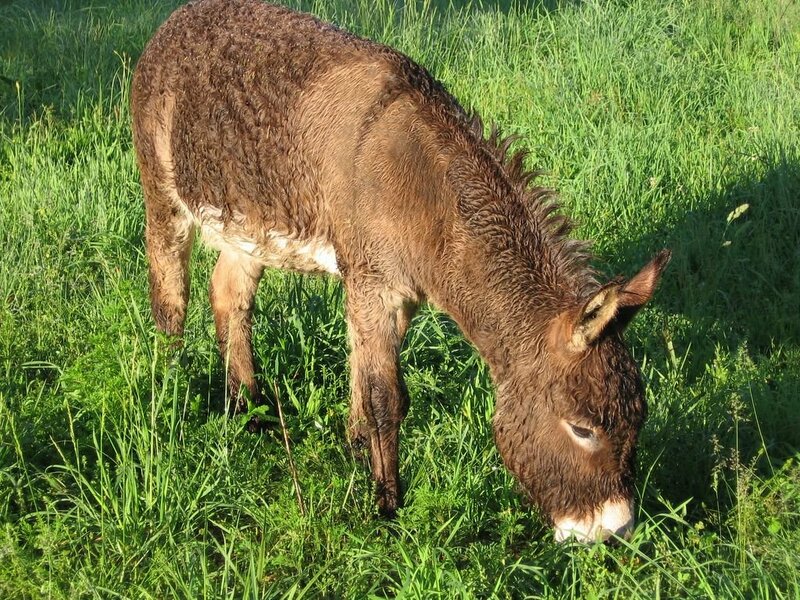 Donkeys are very smart creatures and farriers know it. I do not envy the fella you called. I do hope however, that the pedicure events are less eventfull and more productive than say your bouncing baby lambers you have there! So is there any chance you'll ever get a photo of a bouncing lamb? I'm going to have to do some Googling and see if I can find video of this. I HAVE seen those goats that get paralyzed or fall asleep when they're started...that's funny stuff. Thanks for the highly entertaining entry this morning! Will definitely help me make it through this Friday at work, thinking about all the adventures you're having out there. Good luck with Dan! Just the thought of all those bouncing lambies makes me smile. hehehe I can't wait to hear how it goes. the cookies are a good call--i do the same thing in potential crisis situations. i wonder how much of a difference it makes, whether or not the donkey is castrated? hmmm, intersting morning for you and Dan...Expect the worse, hope for the best. Mine charges $30 for a trim, $60 for trim and shoes. I thought you didn't give out your location to anyone! Good call on the cookie idea. I hope Dan's pedicure is not too traumatic for everyone. Happy Mother's Day Allison, all the other bounced on moms, and to you Farmgirl! Can't wait to see the new baby. I'm still chuckling about your description of the farrier conversation--"all jack". Farmer language is all new to me, and hopefully Dan will be cooperative for his pedicure. Funny, I make chocolate chip cookies whenever I'm expecting the plumber, electrician or carpenter. They all seem happier when they leave. Could Bear soothe Uncle Dan, by hanging out during The Ordeal? I once visited a old brewery that had humongous draft horses.The horses had a "pet goat", who was said to be a calming influence and soothe the horses when they got nervous. Of course Bear might not be into that. You know there already is cookie called Snicker Doodles...will they do? Glad that you lived through the Pedidonkeycure. I know he is glad it's over! I did love the butterfly story but didn't get a chance to comment, had to dash off to workie so I could buy some wool to spin. It's like crack, once you get hooked you are totally hooked!! Oh my. I think I may have inadvertantly started a hip new phrase: "all jack." LOL. Re photo of bouncing lambs: I will definitely try to get one. And as I mentioned yesterday (? ), my camera has a movie mode I need to learn how to operate. Because really, there is no way to explain in words exactly what Bouncing Sickness really looks like. Bouncing lambies and smiles definitely go together. I totally forgot to ask the farrier if Dan's being castrated made any difference as far as working on him. It was kind of a whirlwind visit, to say the least! I did just that--expected the worst and ended up with the best! So relieved. 1. Meet them 17 miles away in town. 3. Spin them around 3 times. 4. Toss them in the back of the pickup. 5. Drive to the farm, making several wrong turns in the process. It's only been a few hours, but Dan's chill is already starting to thaw. A little. You and I were thinking right along the same lines. In the middle of the farrier and his son's attempts to capture Dan, I realized that Dan's buddy Bear wasn't around--and that he would surely have a calming effect on Dan. So I launched into an explanation of how much Dan loves Bear, etc. etc., called Bear over, and only then did I remember that Bear is totally frightened of strange people. He wouldn't come near us! No, Snicker Doodles won't do because The Doodle Monster would no doubt complain. just a word of advice from one donkey owner to another - try to find a farrier that specializes in donkeys. we had a really wonderful farrier who didn't generally do donkeys coming to do our miniatures and though the animals weren't a problem, the farrier just wasn't keeping their hooves in good shape. months later we found a farrier who specialized in donkeys and omg, in one session the difference was astounding. their hooves need to sit flat rather than at a slight angle like horses and i was so thrilled to see them looking so good. much faster too. i wasn't there though the first time he came and apparently they had a heck of a time catching them. they are much more obedient with me than my dh (maybe its b/c dh is all jack? lol) and they are getting used to the farrier now. love talking donkeys. sorry - i'm rambling.